Describe how developing secure Lightning components differs from developing secure Visualforce pages. Summarize security protections enforced by Lightning Locker. Sign up for a special Security Testing Developer Edition org. We’re pretty excited about Lightning. It’s the future of the Salesforce platform, and offers several improvements over Visualforce. There are a lot of changes under the hood that affect how we provide the best user experience, and how we secure customer data. In this module we show you how to take advantage of the security we built into Lightning. The material here builds on concepts in the Develop for Lightning Experience trail. If you haven’t yet completed the modules in that trail, go there first. For more information about Lightning web components, see Introducing Lightning Web Components. In the Lightning Component framework, the UI and components communicate with each other by responding to events. Components can talk to the server and to other components. Each component is responsible for its own security within the Lightning environment. This means everyone who creates or maintains a component must understand how to write secure code for Lightning. Aura and Visualforce handle security in different ways. If you’ve done a lot of work in Visualforce, it helps to know about these differences. From a security perspective, there are three main differences between Visualforce and Aura: shared resources, encapsulation, and data security. In Visualforce, you build complete pages, and it’s difficult to reuse material on a page. In Aura, the basic building blocks are components, which are reusable and easily replaceable. An Aura application that uses a component can instantiate that component several times within a page. Salesforce doesn’t support code that attempts to modify components on a page outside the Aura framework. Anything that changes data in a component without using its attributes, methods, or Aura framework methods is unsupported. This kind of code can cause instabilities or vulnerabilities in your app. Visualforce enforces the active user’s CRUD and FLS permissions when a page renders a Salesforce object. Aura doesn’t do any client-side authorization, so it doesn’t respect these permissions. The following code shows data to all users, even those who aren’t authorized to see it. When you write Aura components, do your own data access checks in your Apex controllers. Aura components are very powerful. They can do easy things like displaying data, or they can do more complicated things like creating and modifying records. Components interact with each other using Aura attributes and methods. Aura lets you control who can access the attributes and methods you write. We’ll cover access control in a later unit—for now, we just want you to know that it’s there for you to use. If you want to do a server-side operation, you write an Apex handler for that action. You do this by writing a function in Apex with the @AuraEnabled annotation. To prevent another component from calling your server-side Apex function, use standard access control (CRUD/FLS/Sharing) for the user in every @AuraEnabled method. You know you must secure each of your components against malicious input. There are a lot of baddies out there, so you can’t trust any input the component handles. But how do you identify malicious input? Ask yourself: Does your component have a specific purpose? What do you know about the input it handles? How is it used? The more you can describe what good input looks like, the better you can protect against anything that doesn’t match that description. Overly general components are difficult to secure. If a component does something really broad like “render input,” you can’t tell whether that input is good or bad. Here’s an example of a general component. Where is the iframe coming from? If you knew where it was supposed to originate, you could whitelist its domain and block frames from other sources. But if another developer decided to reuse your general component to render something else, your whitelist might not work for the new use case. Create components for a specific use case, rather than general components that do it all. Specific components have security requirements in their specification—general components don’t tell you how to secure against bad input. Lightning Locker is Salesforce’s security architecture for Aura components. Lightning Locker isolates individual Aura components in their own containers so they can’t interact with one another directly except through tools provided by the framework, like Aura attributes or events. This component-level isolation protects your app from malicious components written by other developers, and it allows only interactions that you explicitly declare. Lightning Locker also provides explicit security measures for your components, such as a Content Security Policy (CSP) to help mitigate cross-site scripting (XSS) attacks and resource restrictions to ensure that images and scripts load securely. Uncaught TypeError: 'caller' and 'arguments' are restricted function properties and cannot be accessed in this context. CSP isn’t enforced by all browsers. For example, Internet Explorer 11 doesn’t use it. For a list of browsers that enforce CSP, see Can I use...Content Security Policy. You use a hands-on org to work through the challenges on Trailhead. This org is a safe environment where you can practice fixing security vulnerabilities in Aura components. For all of the modules in this trail, we’ve created a special org: the Kingdom Management developer org. This org contains several vulnerable applications, so you can spend your time honing your security skills instead of writing your own vulnerable Force.com code. The object of each challenge is simple: identify the vulnerabilities and fix them. Use a Kingdom Management developer org for these challenges—you can’t use an existing Developer Edition org or a Trailhead Playground org for any of the modules in this trail. Here’s how to sign up for a Kingdom Management developer org. Go to the custom sign-up page for the Kingdom Management developer org. Fill out the form using an active email address and click Sign Me Up. Check your email for an activation request. Click the link in the email, and complete your registration by setting a new password and challenge question. When you have your Kingdom Management developer username and password, you’re ready to learn how to protect your users and data with application security. The code in the Kingdom Management application is vulnerable to certain attacks. These vulnerabilities can’t do any damage in a Developer Edition org, but they can wreak havoc if they get into a production Salesforce environment. 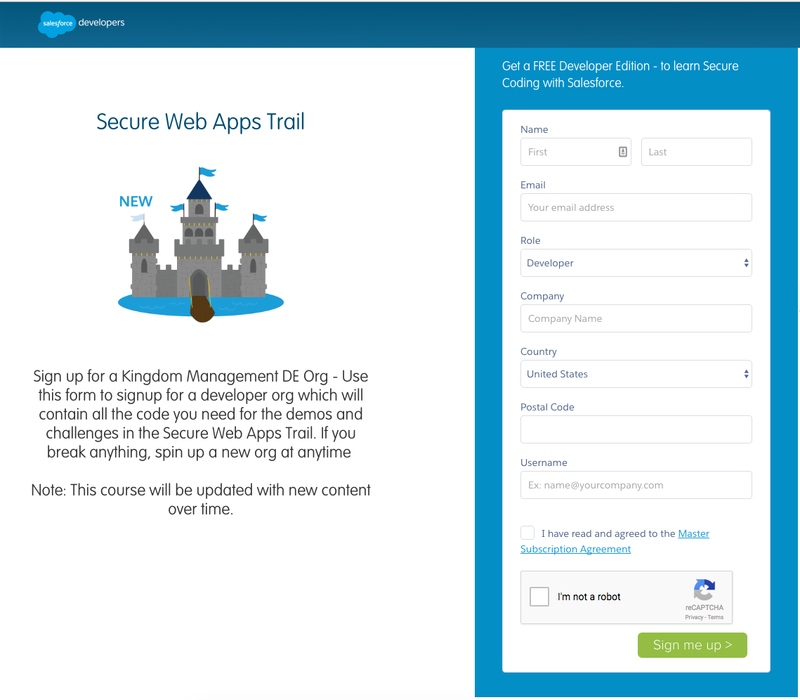 Use the Kingdom Management application only to learn about security and vulnerabilities. In the next unit, we take a look at how to use HTML/Aura markup to create secure Lightning components.